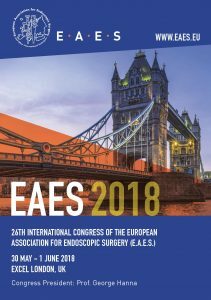 The 26th congress of the EAES, entitled “Excellence through marginal gains” took place in London, May 31st – June 1. The meeting was organized in association with the Association of laparoscopic Surgeons of Great Britain and Ireland (ALSGBI). This congress was attended by more then 1200 delegates from 80 different countries, emphasizing the over- continental dimension of this scientific event. Click HERE to read the congress review. Or click on the image below to browse through the program booklet of 2018.